Gravure printing is a magical printing process. Although the process is simple, the printed images have rich layers, bright colors, good definition and high quality. The only challenge is the difficulty of making gravure cylinders. The first copper plated gravure cylinder was introduced in 1446. It has been a few hundred years since its inception. With the development of science and technology, the gravure plate making technology has become more and more advanced, and it has become increasingly complex. During this period, it has undergone several stages of development. The earliest appearance was the manual gravure, followed by dry gravure, artificial dot gravure, erosion gravure, and direct engraving intaglio. A variety of gravure plate making process, the core problem and the most basic principle is to use what kind of imaging methods, whether direct mechanical engraving or corrosion on the surface of the copper layer. People who have experienced erosion in the gravure platemaking era know that the etching and plate making process is quite complicated. Moreover, in the etching and plate making, a lot of expensive materials and equipment are needed, and many of the process steps have to be completed by manual operation. Many are subject to the subjective factors of the operator. Compared with the etching platemaking process, the electronic engraving plate making process is too simple, and it can also realize the digital control of the process. The operation is simple and the quality is reliable. At present, no-film engraving has been realized, and the original information is no longer required to be scanned. The electric carving needle can be directly driven and controlled, and the engraving process can be controlled by software. The electronic engraving plate process greatly simplifies the production process of the gravure cylinder and improves the production efficiency. The quality of the plate cylinder and the reliability of the plate making process have also been greatly improved. In addition, because many chemicals that are harmful to the human body have been abandoned, the working environment has not only been improved, but also better for the health of the operators. For example, in the case of gravure plate cylinders for printing and printing, two color separation pages can be produced per person per shift using a corrosive plate making process, but with an automated K6 Klischograph engraving machine, 150 color separation pages per person per shift can be produced. . The same is true in the field of packaging and printing, and the electronic engraving method has greatly improved the platemaking efficiency. In the future no matter what re-embossed platemaking technology will emerge, in order to gain recognition and great development, we must meet certain conditions, namely whether we can guarantee the quality of the upgraded cylinder, production efficiency and process reliability, which is also a measure of each The important criteria for the advanced nature of new processes and new technologies. If the process cannot be simplified, new processes cannot satisfy people's needs. Normally, some references refer to the gravure as a continuous tone printing, that is to say, when the ink is transferred from the cell of the plate cylinder to the paper, a true natural gray value can be obtained. Because the gravure ink is as thin as water, it is transparent on the surface of the paper and has a filtering effect on the light, similar to the performance of the silver salt layer in the photograph. At the end of the 19th century, with the development of photographic technology, people put forward higher requirements for continuously adjusted image printing. The first proposed mesh tuning theory for continuous tone screening is that the gray value of the image is represented by dots of different area sizes. This method has been used up to now, but the way of original manuscript has been greatly affected. change. Originally used non-contact screening, but later replaced by contact screening, now is done by the RIP (raster image processor), usually with a value between 0 and 255 to represent the gray value of the image, and then RIP transforms into dots of different shapes, sizes, and positions. The electronic engraving gravure process is obviously much simpler than the plate imaging process of embossing, offset printing and flexo printing. The value corresponding to the gray value of the original image can be directly transmitted to the electronic engraving machine, and the diamond engraving needle is controlled to perform engraving on the surface of the copper layer. Moreover, the area and depth of the engraved cell can be changed. It is worth mentioning that electronic engraving can achieve high-quality gravure plate cylinders suitable for specific printing conditions (including printing presses, ink, paper, etc.) by simply adjusting the tone curve. As described above, it is very important to use the gray value data to control the electric engraving needle to achieve an exact match with the gravure continuous tone image. In other words, the perfect combination of electronic engraving and gravure printing process has greatly improved the reliability of the process and the quality of the plate cylinder, which is incomparable with etching gravure (including traditional gravure and direct screen gravure). It is worth mentioning that, unlike offset printing, in the reproduction of text and lines, electronic engraving cannot achieve finer reproduction than the selected number of engraving lines, which limits the reproduction quality of text and lines. In recent years, HELL has improved the dynamic control of electric engraving needles and developed HQH software, which can effectively eliminate the "jaggies" of small yin and yang lines. Also, in many cases, gravure text is softer and easier to read than offset printing. However, there is no doubt that packaging printing has a higher demand for gravure printing quality, and people hope that the printing quality of text and lines can be further improved. Due to the many limitations of the traditional gravure platemaking process, HELL has set new goals with its 40 years of experience in the field of plate making, and it is necessary to further improve the platemaking process and quality of gravure cylinders. In order to achieve this goal, what kind of protection can be provided from a technical perspective? The following briefly describes the imaging technology of the gravure cylinder. The traditional photogravure, also known as "shadow edition," completely relies on changes in the depth of the cell site to represent the tone level. For this purpose, the carbon paper must be screened and sun positively treated with screens and continuously adjusted images, respectively, and mesh holes with the same area size and different depths can be obtained according to the difference in the permeability of the carbon paper to the etching solution. From the above, we can easily see that the traditional gravure platemaking process is more complicated and has many steps. There are 11 steps from preparation of carbon paper to corrosion. Therefore, the predictability and repeatability of the process are relatively poor, for example, The depth of corrosion of the cell and the control of the wall are very difficult. However, what is more difficult is the control of the bright tuning part. The bright tuning requires that the depth of corrosion of the net is very shallow and cannot exceed 1 Î¼m, but it is really difficult to achieve. At the same time changing the area and depth of the mesh can solve this problem, but it must be secondarily exposed to carbon paper. The depth of the cell site is controlled by one imaging with continuous tone pictures. Secondary imaging uses the same original screen, so that the depth and area of â€‹â€‹the mesh can be changed at the same time. The emergence of such gravure platemaking technology marks a step forward in the reproduction of bright and dark tone. However, the inherent instability of carbon paper and corrosion is still a problem. After all, the process is too complex and difficult to control. . With the advent of electronic engraving technology, electric engraving needles can easily and precisely engrave cells of different area sizes and different depths, and the process is simple, the consistency and reliability are high, and therefore it gradually replaced the traditional gravure. 1.The Champagne Bottle Holders is made of neoprene rubber material ,normally the thickness is 1/8" . And we provide different thickness for customized. 2.The neoprene champagne Bottle Coolers accepte customized logo , simple brand name or full color printing . Both sides printing on champagne bottle sleeves is accepted. 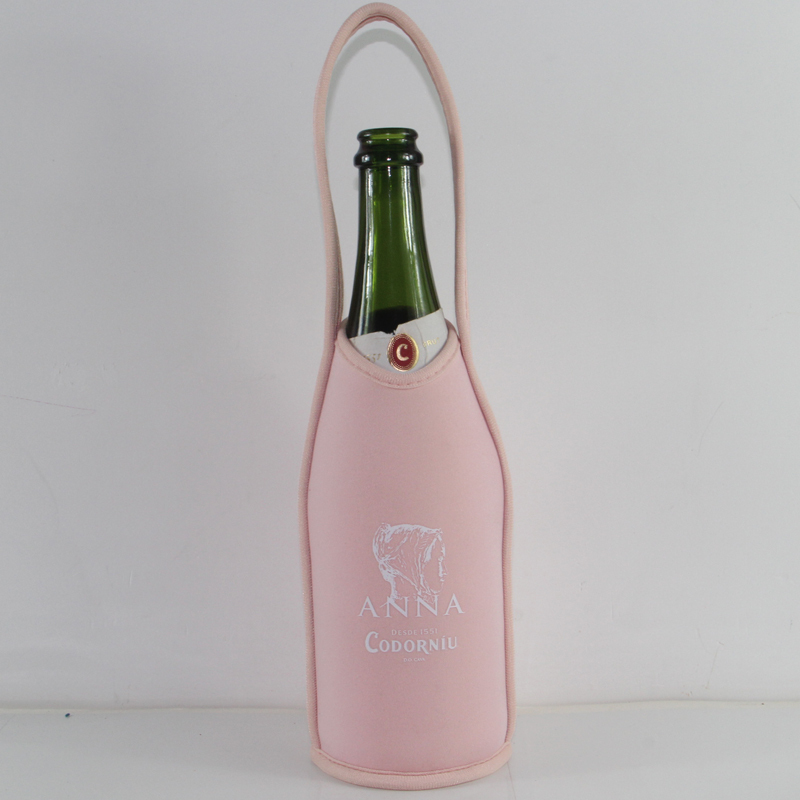 The file of logo for champagne bottle coolies we need PDF or AI file ,1-3 days,customized design sample finished . 3.Our neoprene champagne bottle sleeves is waterproof ,breakage-proof . Lightweight and foldable ,easy to take can and carry . 4.The champagne bottle totes can hold on full champagne bottle , used for picnic and camping . 5.The neoprene champagne bottle cooler bag keep temperature about 1-4 hours .